Whilst we often think first of perennials when looking for ground cover plants, there are many low growing shrubs that do the job quickly and effectively and that can provide a longer season of interest and more spread for your money. Cotoneasters are wonderfully versatile shrubs which can be evergreen or deciduous and vary widely in size and form. However, one thing that they all have in common is their long season of interest and easiness to grow. Cotoneaster conspicuus ‘Decorus’ is a low growing, semi-evergreen cotoneaster with very small, glossy dark green leaves, an arching habit and a mature height and spread of 1-1.5m x 2m. The branches are smothered in small white flowers for a long period in summer which in autumn are followed by bright red berries. 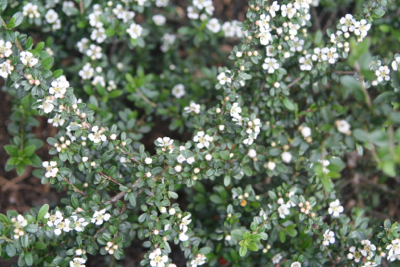 Any well-drained soil and any aspect will suit this Cotoneaster which makes it especially useful in dry, shady spots, but it may need protection from cold, drying winds in colder areas. 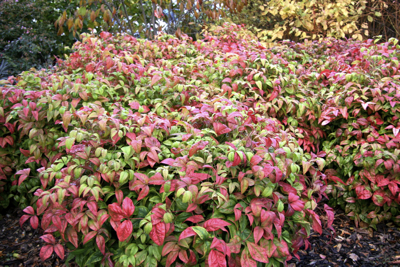 Nandina domestica ‘Firepower’ provides neat, colourful ground cover with a long season of interest in a sun or part shade and looks great planted in groups. 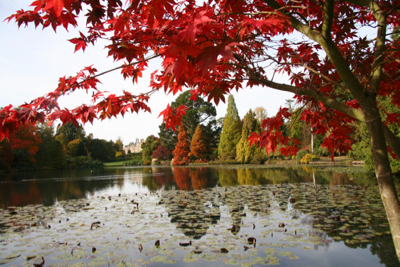 It is a dwarf form of heavenly bamboo with a compact, rounded form and shiny mid-green leaves that turn fiery shades of red and copper in autumn. Additional autumn interest is provided by the glossy red berries while in mid-summer conical clusters of tiny white flowers appear amongst the leaves. Frost hardy (it may need some protection in colder areas), it is not fussy about soil type as long as it is moist and well-drained. Garden tip: lightly cut back any shoots that are spoiling the overall shape in mid to late spring. As well as providing wonderful fast growing ground cover in full sun or partial shade, Salvia officinalis ‘Purpurascens’, or purple sage, also scores highly on good looks, aroma and usefulness. 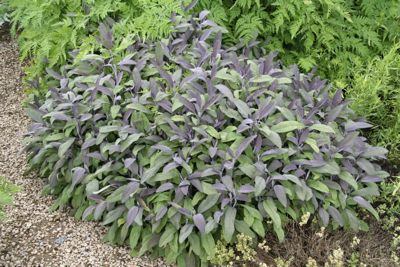 The highly aromatic young leaves emerge a deep reddish purple maturing to a lovely soft grey/green with a mauve hue (the hotter and sunnier the conditions the deeper the purple colouring). Purple sage combines particularly well with any purple/lilac/mauve flowered plants such as lavender or nepeta, and bees love sage’s own beautiful lilac/mauve flowers that appear over a long period during May to July. Purple sage leaves have the same culinary uses as common sage including making a tasty, astringent tea which has a variety of medicinal properties and the edible flowers look really lovely scattered over summer salads. Sage is fully hardy as long as it is grown on well-drained soil that is not acid and it makes a good container plant. Height and spread: 100cm x 80cm. 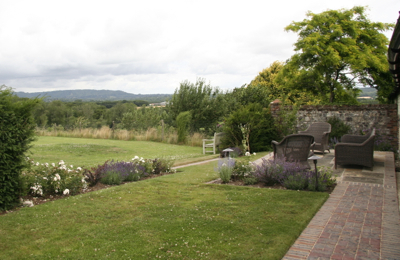 Garden tips: Prune plants lightly after flowering and in spring to keep them bushy. Mature and/or leggy plants can be pruned hard in spring (when it can look a bit shabby after winter), but take some cuttings as insurance. Sage is prone to becoming woody and is best replaced every 4-5 years. Viburnum davidii is a good looking shrub for all seasons with a low growing, naturally domed shape that makes for great ground cover beneath other taller shrubs of more vertical habit. 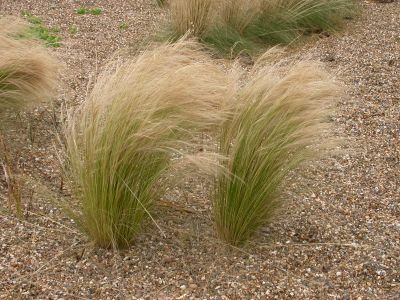 The large leathery oval leaves are dark green and heavily veined and held on red tinged stems. In May flattened heads of tubular white flowers appear, followed later in the year by startling metallic turquoise berries on bright red stems (NB: cross-pollination must occur for fruits to be produced). 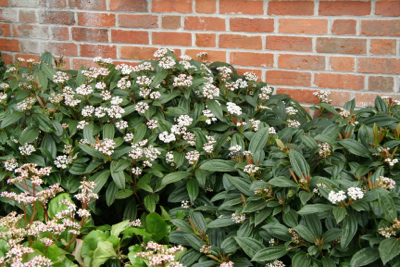 A must for woodland borders, Viburnum davidii is also happy in full sun and on any moderately fertile, well-drained and moist soil. Height and spread: 1m x 1-1.5m. Garden tips: Little to no pruning required. 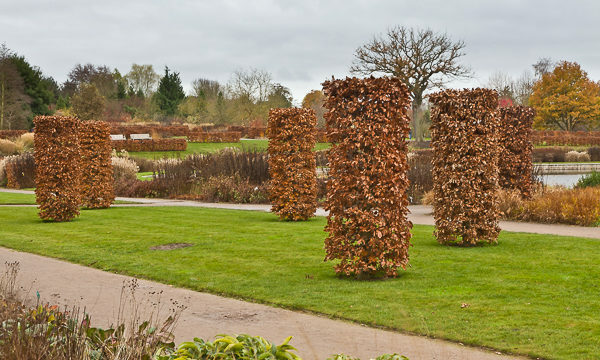 If pruning is carried out, cut back to strong stems or to plant base to retain domed shape. It’s hard to beat a good ground cover rose for sheer floriferousness and, well, ground covering. Rosa ‘Kent’, one of the ‘Towne and Country’ series, is a repeat-flowering, reliable performer that forms a small, neat mound and looks good over a long season. 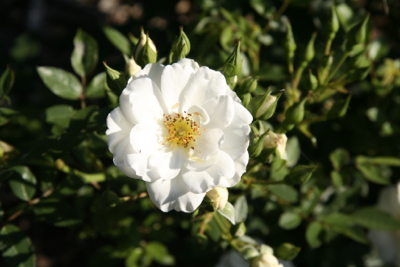 Slightly scented, semi-double white flowers with a cream flush open in great abundance from July to September, set off perfectly by the shiny dark green leaves and followed in autumn by small red hips. 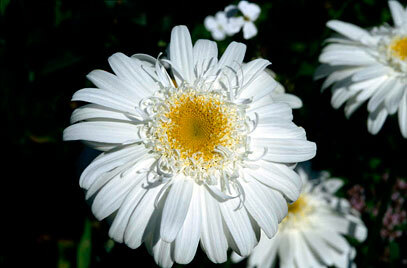 Requires a fertile, humus rich, moist soil and full sun to light shade. 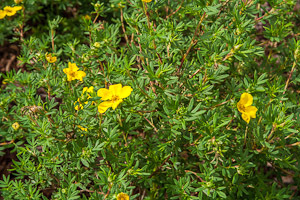 It makes a good patio plant in a container and the flowers, which stand up well to rain, are also good for cutting. Height and spread: 1m. Gardening tips: Little annual pruning required. 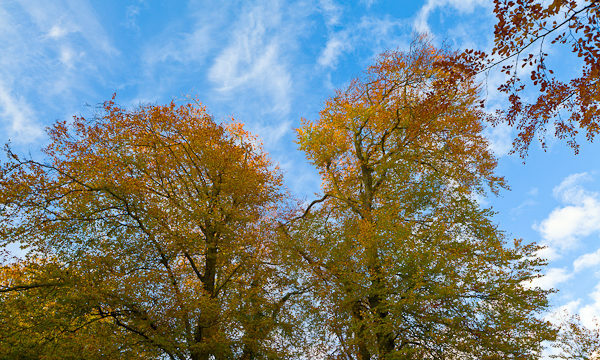 Remove dead, diseased, damaged or congested branches to the base in late winter. If plants grow too large for their allotted space, prune vigorous branches by one third and prune side shoots to two or three buds from main stem. Good info here for a greenhorn gardener like I am.